8 | TH E M R EP O RT TAKE 5 if they have positive information outside of the credit repositories, for example having paid cable or telecom bills on time. We've found that over one-third of these newly scored consumers have scores over 620, which is a common threshold for acceptance by lenders. Once a consumer has acquired credit through the use of FICO Score XD for six months, they will obtain a traditional FICO Score. This is a great approach for solid, sustainable access to credit. M // Some lawmakers believe that the use of the FICO-only M // There have been many reports recently discussing the use of alternative data to score borrowers. Will this shift remove FICO scoring from the picture completely? How will your busi- ness be affected? GASKIN // FICO Score XD was developed to safely expand access to credit by ensuring a reliable way to leverage alternative data— data that isn't included in stan- dard credit bureau files—to create an on-ramp for millions of con- sumers to mainstream financial services. The difference between FICO innovation and some other companies is that our solutions scale massively, the FICO Score scales for a large population, not a niche, making our scores both highly effective and efficient for both lenders and investors. M // Millennials are the genera- tion known to not have pristine credit at this time but still desire homeownership. Is alternative data appropriate to consider for this generation? GASKIN // Access to credit is an in- credibly important issue for millen- nials and really for everyone. 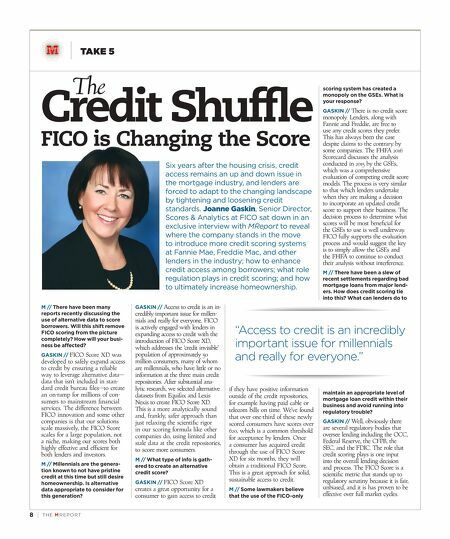 FICO is actively engaged with lenders in expanding access to credit with the introduction of FICO Score XD, which addresses the 'credit invisible' population of approximately 50 million consumers, many of whom are millennials, who have little or no information at the three main credit repositories. After substantial ana - lytic research, we selected alternative datasets from Equifax and Lexis Nexis to create FICO Score XD. This is a more analytically sound and, frankly, safer approach than just relaxing the scientific rigor in our scoring formula like other companies do, using limited and stale data at the credit repositories, to score more consumers. M // What type of info is gath- ered to create an alternative credit score? GASKIN // FICO Score XD creates a great opportunity for a consumer to gain access to credit The Credit Shuffle FICO is Changing the Score Six years after the housing crisis, credit access remains an up and down issue in the mortgage industry, and lenders are forced to adapt to the changing landscape by tightening and loosening credit standards. 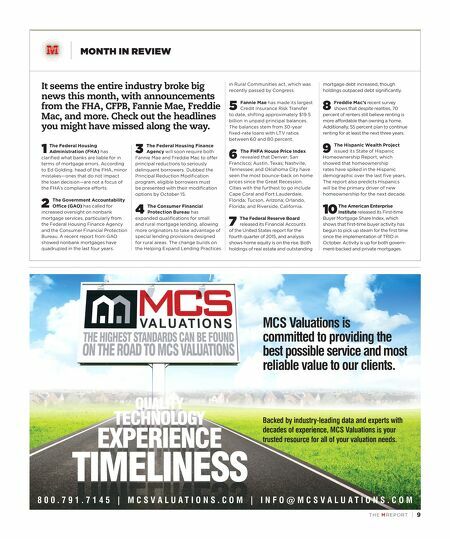 Joanne Gaskin, Senior Director, Scores & Analytics at FICO sat down in an exclusive interview with MReport to reveal where the company stands in the move to introduce more credit scoring systems at Fannie Mae, Freddie Mac, and other lenders in the industry; how to enhance credit access among borrowers; what role regulation plays in credit scoring; and how to ultimately increase homeownership. scoring system has created a monopoly on the GSEs. What is your response? GASKIN // There is no credit score monopoly. Lenders, along with Fannie and Freddie, are free to use any credit scores they prefer. This has always been the case despite claims to the contrary by some companies. The FHFA 2016 Scorecard discusses the analysis conducted in 2015 by the GSEs, which was a comprehensive evaluation of competing credit score models. The process is very similar to that which lenders undertake when they are making a decision to incorporate an updated credit score to support their business. The decision process to determine what scores will be most beneficial for the GSEs to use is well underway. FICO fully supports the evaluation process and would suggest the key is to simply allow the GSEs and the FHFA to continue to conduct their analysis without interference. M // There have been a slew of recent settlements regarding bad mortgage loans from major lend- ers. How does credit scoring tie into this? What can lenders do to maintain an appropriate level of mortgage loan credit within their business and avoid running into regulatory trouble? GASKIN // Well, obviously there are several regulatory bodies that oversee lending including the OCC, Federal Reserve, the CFPB, the SEC, and the FDIC. The role that credit scoring plays is one input into the overall lending decision and process. The FICO Score is a scientific metric that stands up to regulatory scrutiny because it is fair, unbiased, and it is has proven to be effective over full market cycles. "Access to credit is an incredibly important issue for millennials and really for everyone."